Lifters 4 80 kV Lifts more than its weight. Also known as electrostatic corona motors. This is an ionic wind powered device that makes a small wire device rotate when connected to high voltage. I will post details of a small one and video soon. Best results are with DC high voltage. 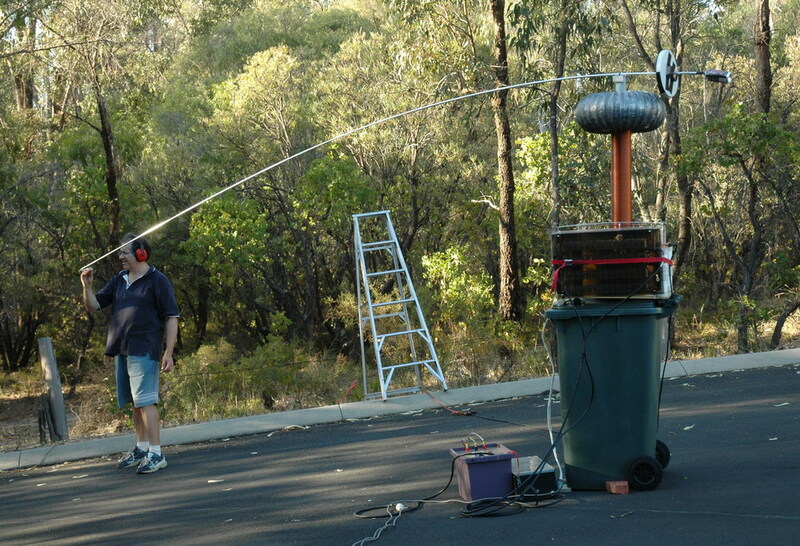 To demonstrate this a 14 foot (4.2 m) spinner cannot be turned by a Tesla coil making 2 foot sparks (100 kHz AC) but can be turned by a DC supply running perhaps 60kV with 3 inch sparks. 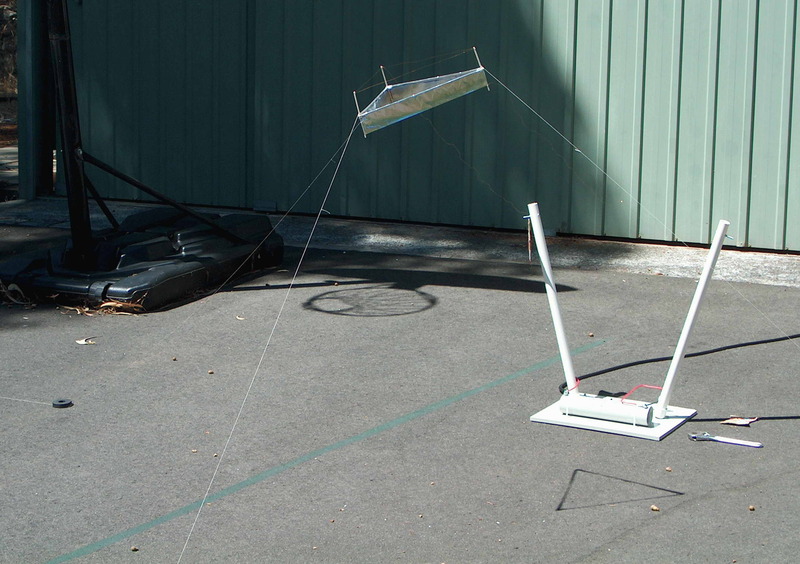 The left photo above shows the 14 foot (4.2 m) arm that turns on a 1 mm shaft and has low enough friction to drift in the wind. The center photo shows the Tesla coil and the corona from the shaped tip and multiple breakout points in this 14 second exposure. 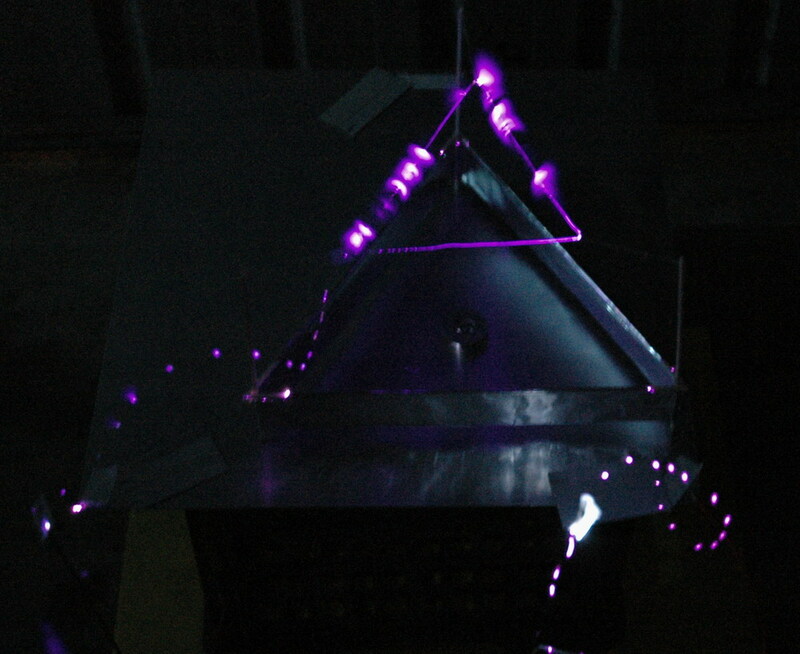 The Tesla coil did not move it. 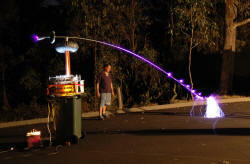 The right photo shows the rod electrically disconnected from the Tesla coil which is off. I have hooked up my 60 kV supply and on this time exposure of 36 seconds you can see the rod has rotated through at least 180 degrees (see the faint rod above my head which is briefly lit by the sparks that I made as it passed). This lack of performance by a large TC was unexpected. My explanation as to why a large one doesn't work, but a small one does, is due to the rectifying effects of different shaped electrodes. 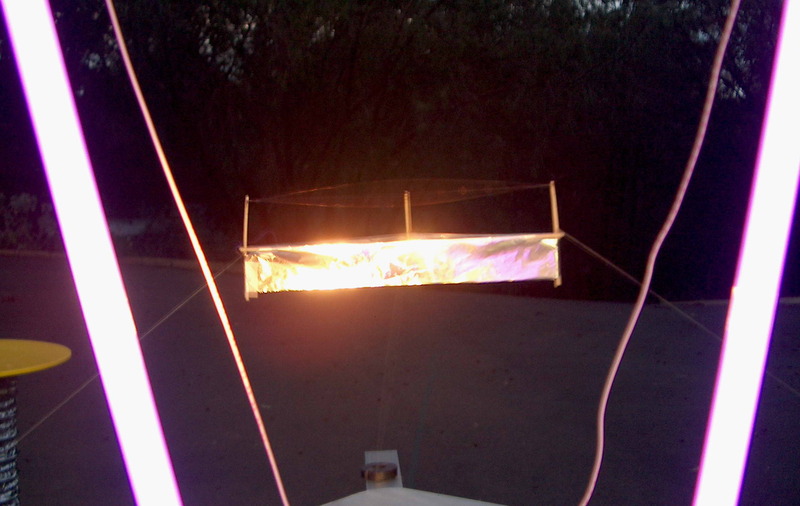 Spark length can vary by a factor of up to three based on my past experiments from a needle point to a plane depending on which way around the polarity is (negative needle electrodes give the longest corona). Hence a small streamer from needle points will ionize a larger volume of air in one polarity than the other due to it's diode like effect. A mass movement of air can then take place from the excess of a single charge and thrust occur. With a larger TC, however, the large streamers can reach a large area well out of the sphere of influence of needle points and charge accumulation does not occur. 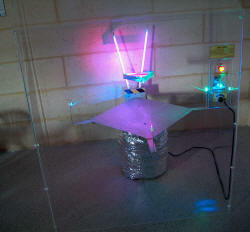 To demonstrate this, your hair does not stand on end if you are near a large TC but does with much smaller DC voltages. Now if I had a big diode in line with the corona point then it should work. 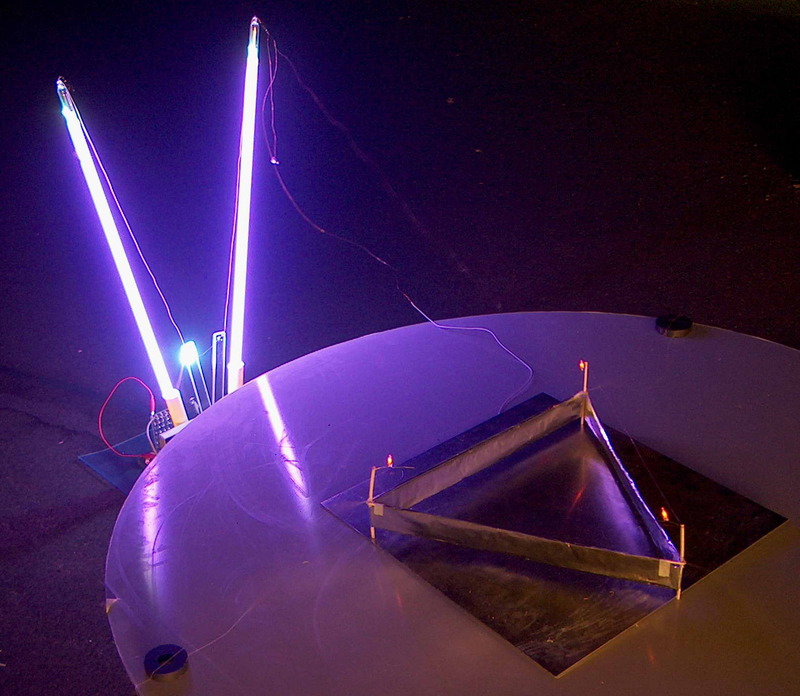 500kV high speed diodes however are not cheap. I need to give this more thought. 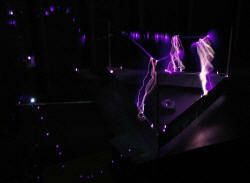 Others have run these on small Tesla coils however. 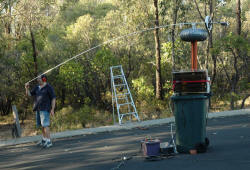 Lifters 1 2003 (ionic wind powered device) These are a nifty thing to do high voltage. 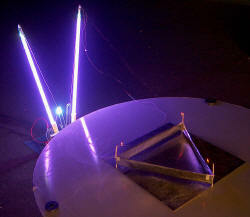 In essence they are devices that levitate using ion wind created from a DC high voltage external source. 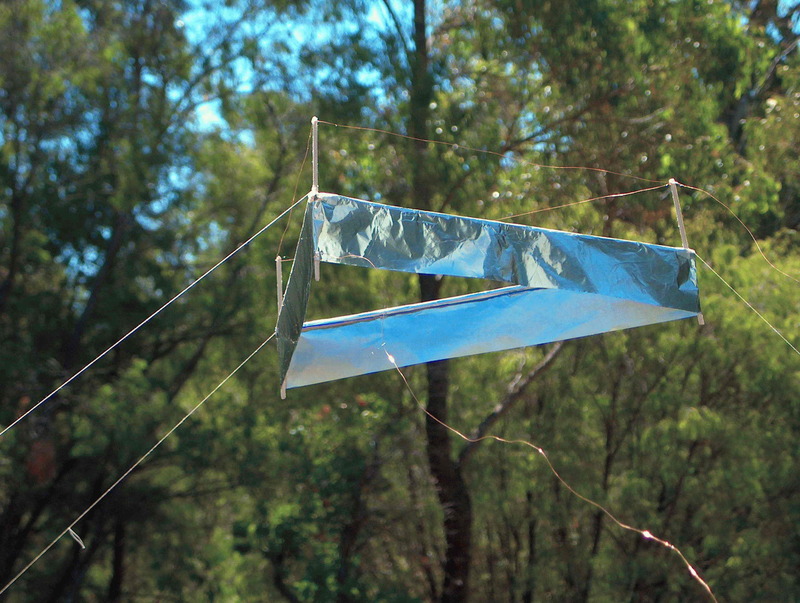 In my Lifter Mk 1 (which is a typical beginners one) a 40 cm triangular ultra light basla, aluminium foil and wire creation lifts up once around 40kV is applied. A thin wire supported by balsa wood struts is the source of the corona and the foil below is attached to the other polarity (positive or negative). 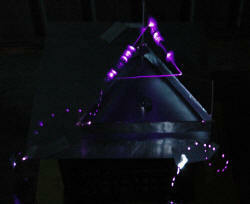 The supply wires are not clearly seen since they get very agitated with the high voltages. 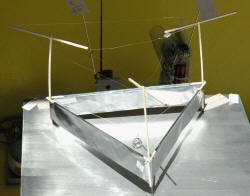 The structure is tethered with cotton taped to the base. 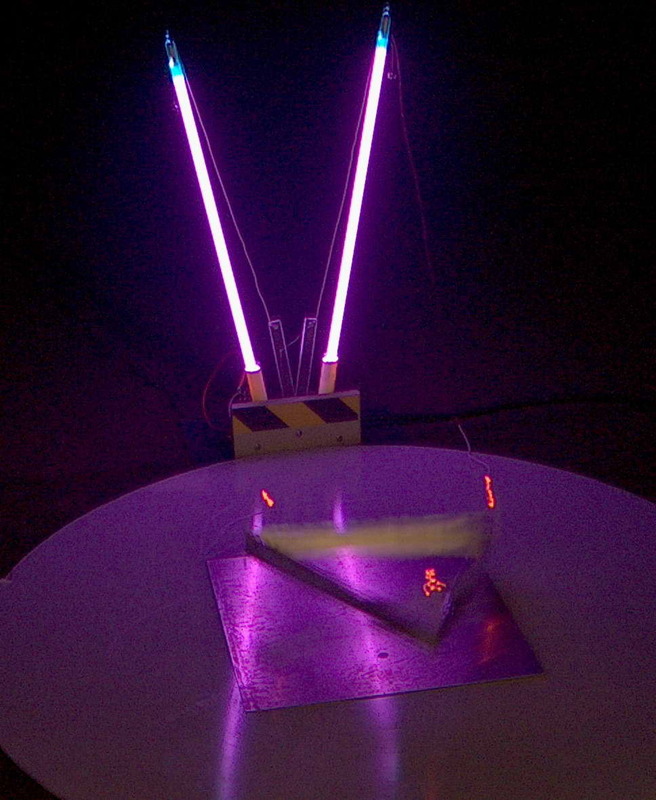 There is occasional arcing across the 3cm between the top wire and the foil at this voltage. 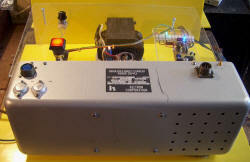 My high voltage source is the x-ray transformer described below run off a variac. The typical output used is 30 kV AC which with the addition of a 290 kV diode and capacitor gives a smoothed, half wave rectified output around 40 kV DC. I have also used the 100 k ohm resistor in series to reduce destructive arcing as it burns out the wire. This is a NASA scientific publication showing no performance in a vacuum and that the principle of operation is due to air ionisation. Pass4sure provides guaranteed braindump to help you pass 640-816 as well as EX0-101 exam on time. 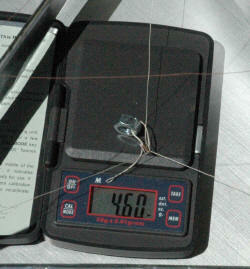 My lifter, give or take, uses 5 W to lift its 3 g (= 0.6 g/W). 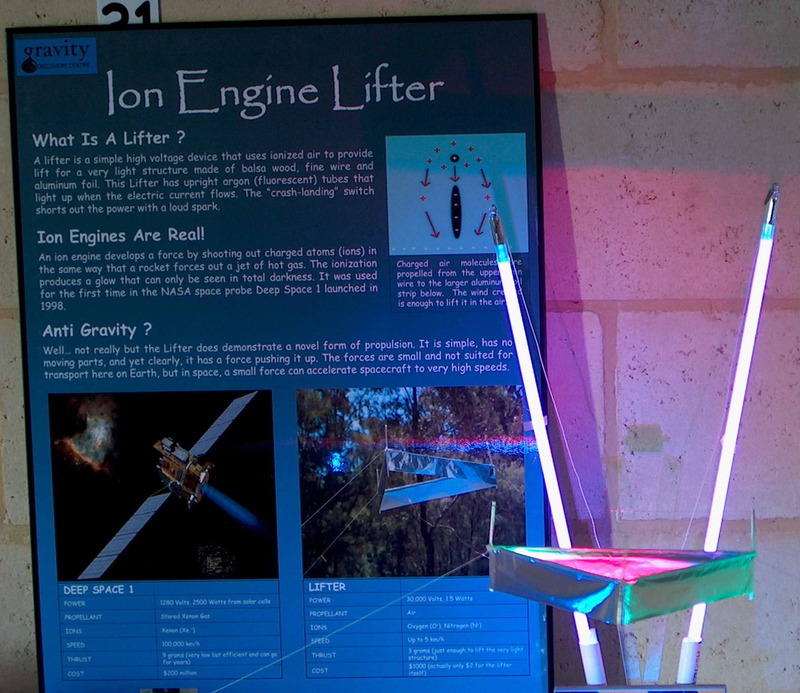 This neat little helicopter weighs about 2500 kG, and lifts a further 2500 kg using 1 MW. This is the power supply setup using a 30 kV DC regulated supply from a 24 V transformer and a small PWM (pulse width modulated) controller. 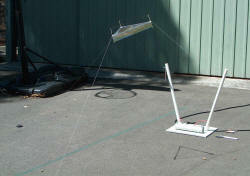 This will be used for the public display lifter soon to be completed. It does not like repeated short circuits (and tends to blow the 2N3055 drivers) but this has been fixed by using a series resistance (12 kohm 5 W plus 15 kohm 5 W in series). This weakens the "Crash landing" spark which then had to be boosted with a 570 pF 40 kV doorknob capacitor. The left photo above is a sunset shot and the right photo shows a view between the argon tubes. I have highlighted the lifter separately. With this shot you can see the range of vibration of the first order harmonic of the closest wire which is about 1 inch in amplitude. If the tension is a little higher or humidity a bit less, this changes to a second order harmonic with a node in the middle. I guess this would be preferred as excursion is less, however the lift will be more as the wire gets closer and if there is an inverse square law then it may even be helpful. 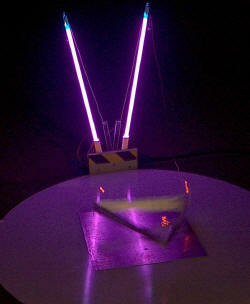 My balsa supports started to track sparks and carbonize as the humidity picked up this evening. This is a prelude to a crash and burn. 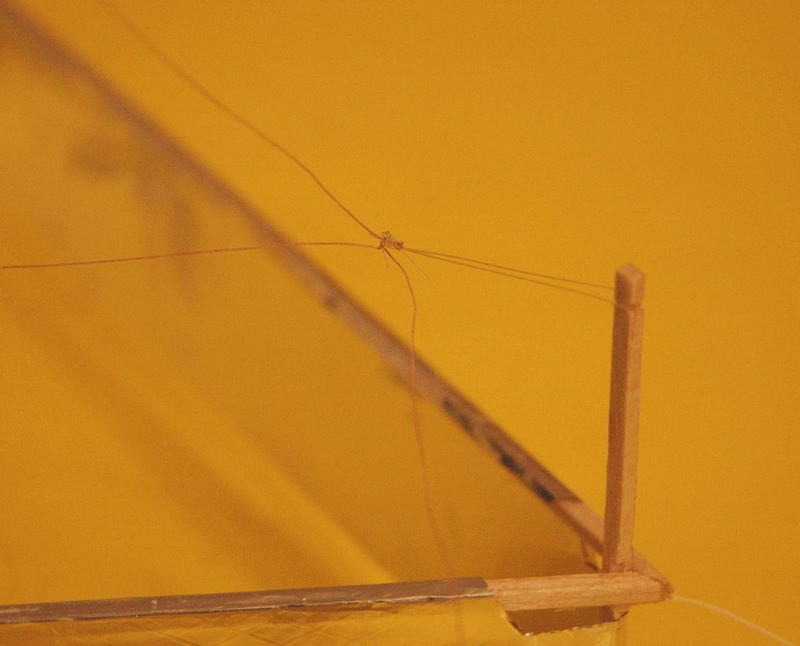 In desperation I used a light oil spray on the balsa supporting the upper wire which seems to have worked fine. I am concerned by the radio frequency interference on both AM (~1 Mhz) and FM (~100 Mhz). There is no problem open circuit and the DC HV wire is shielded up to the upright argon tubes which serve as supports for the HV wire. Shorting the argon tubes does not seem to make a difference. I have tried a ferrite cored coil in series with the active lead with and without a resistor (330 K) although the latter does decrease performance. 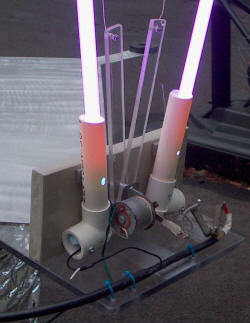 The sealed 30 kV HV unit is driven by a switch mode supply. This supply is giving minimal RF interference as a whine which I think I have fixed by putting a suppression circuit in the 24 VDC line. Some of the RF was corrected with a better connection to the 2x2 ft ground plane. Unfortunately correcting the RF at its presumed source, the corona from the upper wires, is not feasible due to weight constraints. 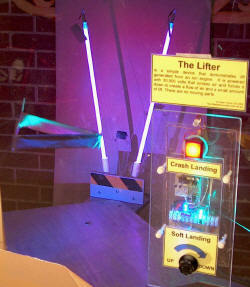 I recently had to display the lifter within a few feet of a large plasma display monitor fortunately without problems. Interestingly, in the final version of the lifter, I did not remove the enamel from the support wires which means that they are a lot less agitated and give a lot less RF interference. I have also wound the support wires into a loosely spaced coil of about 10 turns around the last 6 inches of the argons to try to help block RF but I am uncertain if it helps. 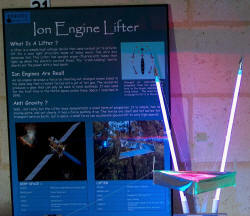 The lifter has now (Nov 5th 2004) been installed at the Gravity Discovery Centre in a 1.5 m square acrylic enclosure. 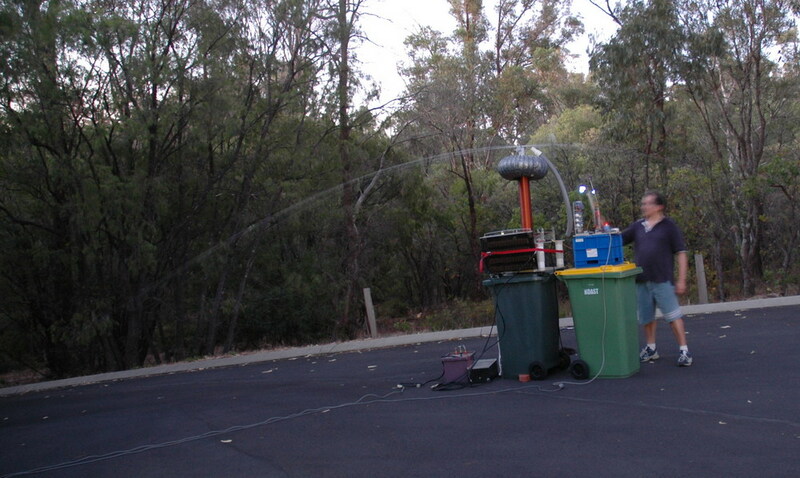 This is the public interface to the gravity wave detector under development here in Western Australia. Still running in May 2006 with periodic replacements of the lifter and repair of fractured and oxidized wires. The left picture shows the display poster. 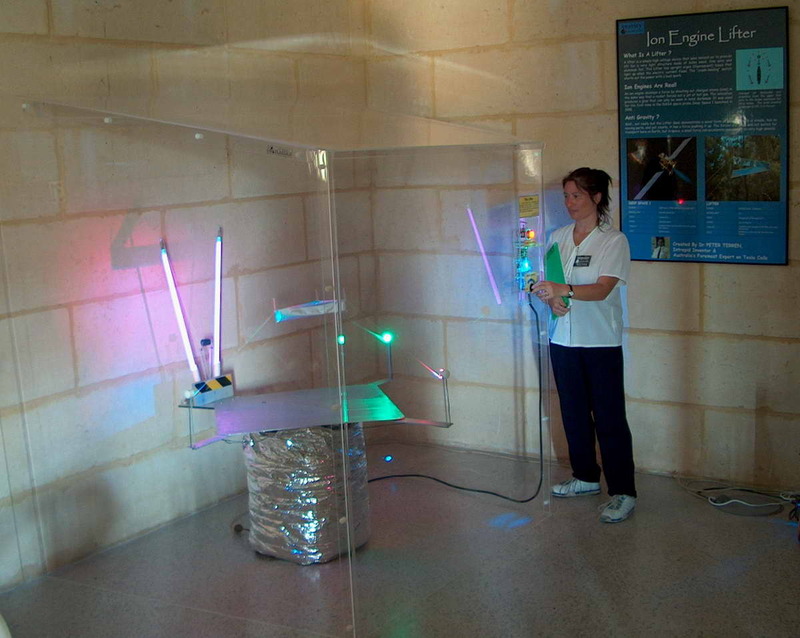 The right picture shows the full installation running. It has to be public proof and withstand lots of 'crash landings' from about 18 inches. The balsa frame is hot glued and also has some reinforcement at the point of impact. 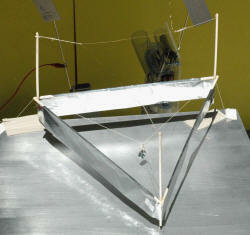 The support cotton threads have been upgraded to string from a small kite which is light and very strong. The display is lit by small arrays of lights with 8 high intensity LED's each with green, blue and purple coming from different directions. 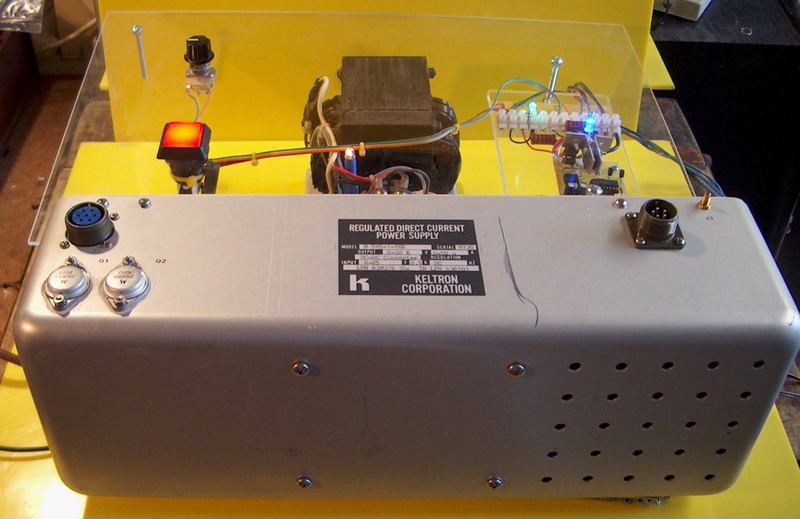 The "soft landing" switch controls the power to the HV supply and is spring loaded to return to the up position. It is a challenge to get a truly soft landing and is nicely interactive in this way. The other problem I have with long term lifters is HV creep and charring of the balsa supports. 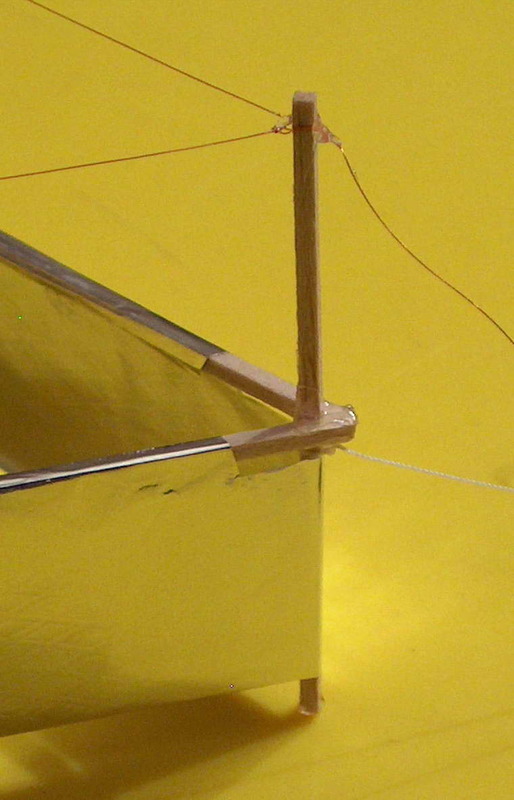 I hope to deal with this with the nylon line support shown above that gives about 1 inch extra distance of the wire to the Balsa upright with a mild penalty in geometry as the top wire is now not vertically above the aluminium skirt. Well, here is my HV lifter running from my 80 kV voltage multiplier driven by a flyback and ZVS driver. It sparks at about 4 1/2 inches between the wires and skirt when turned up full. 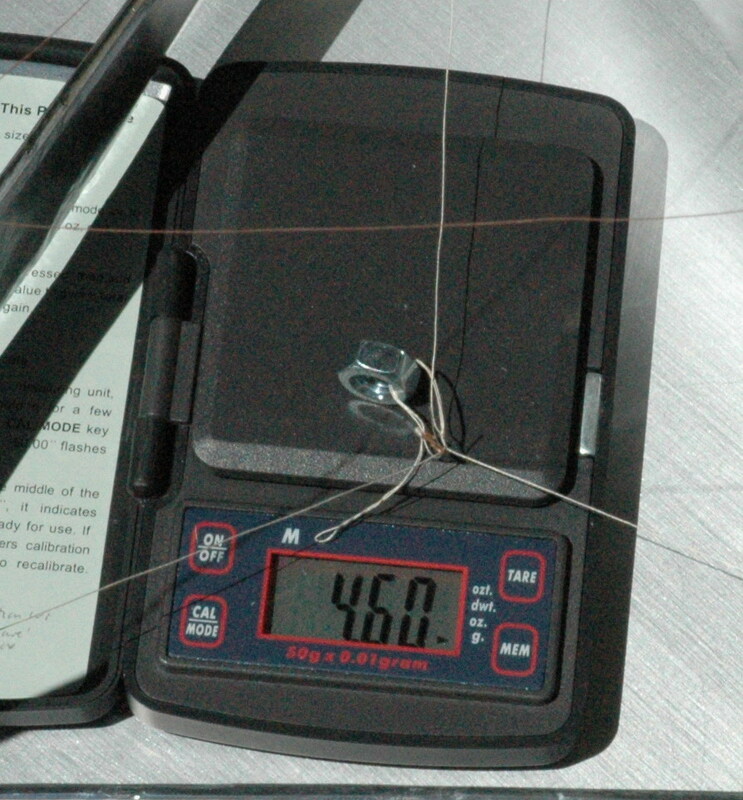 It has a LOT more lifting power and is shown here lifting 4.60 g while the lifter weighs 4.13 g. In other words it is lifting more than it's own weight. I did try dual corona wires but there was no additional benefit with this setup. Either the extra weight penalty or load on the power supply might have caused this result. I later removed it. 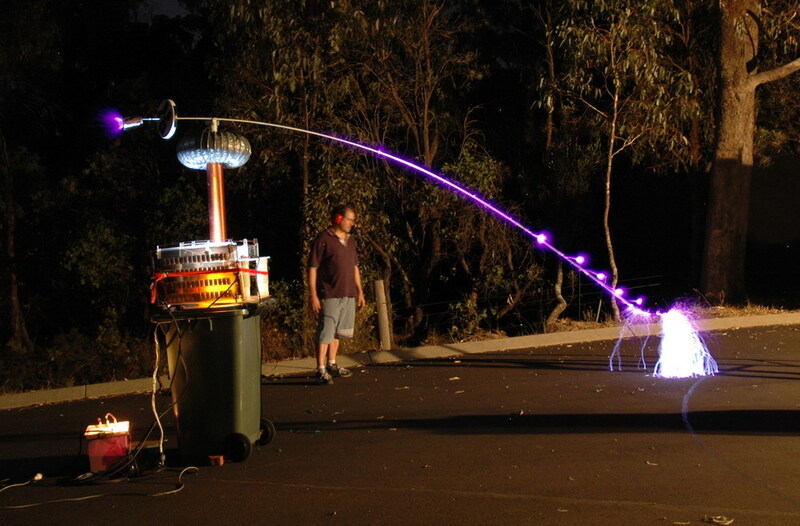 These are time exposure shots showing corona off the lifter with a few 4 1/2 inch sparks thrown in for good measure. Note the lead in wires. I have kept the lifter on the base to avoid movement. At least the threads that support the wires prevent arcing down the balsa supports. Left photo exposure is 58 seconds and the right photo is 22 seconds.